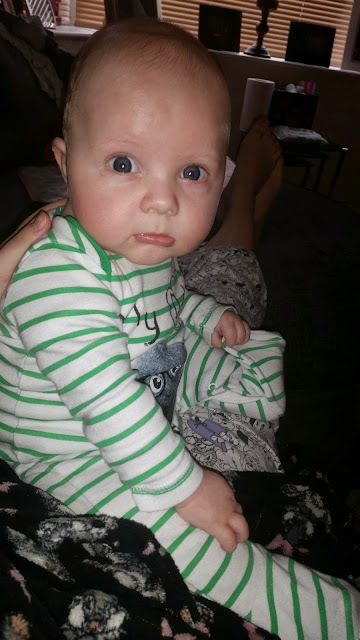 Today is Sunday 19th October and my little chunk Joey is 4 months old! Only 2 months away from him being half a year old. I really feel like the months are flying by, which I'm really excited about because I'm loving watching him grow into a little person. Since his 3 month post there has been a major development...Joey has a tooth coming through! This past week or so he has been drooling a lot, hand in his mouth, out of sorts literally everything included in teething. I know there is definitely a tooth coming through as when i put my finger in his mouth I can feel something rough/sharp on his bottom gum. I've been giving him some Dentinox teething gel which seems to ease any on he is having. He loves it when I run my finger around his gums and let him nibble my finger. He has also started making some noises which actually sound like his talking...I'm pretty sure he said my name but it's just the cutest thing ever. Their is a short video of it on my instagram account: @lollyvarley92. The 4 month mark also means that we can start weaning him. I've bought some Cow & Gate baby rice which we'll be trying with him soon and update you all on his weaning progress. Joey's sleeping pattern is a little bit all over the place at the moment. I don't know if it's because of his tooth coming through but he has been really difficult at night for the past week or so. We got Joey into a really good sleep routine quite early on, he first slept all the way through when he was about 11 or 12 weeks old. So he usually gets really restless and tired around 6.30/7pm so I take him upstairs at all out 6.45pm and sometimes he's happy to have a bottle but usually he just pushes it away and just wants to watch the telly. Usually at around 7.30pm I have him laid down on my chest and tapping his back to get him off to sleep and then I carry him to his moses basket and put Tranquil Turtle on for him. He and so won't go to sleep without his dummy. So usually he can sleep from 7.30/8pm until 6am but thus week I'll put him to bed normal time and he's been waking up at 10pm, 1am, 3am and then 6am. I give him his bottle bottle at 6 and usually were downstairs for 6.30 where he'll have his morning nap for about an hour. During the day he can have 2-3 naps with his late afternoon nap being the longest sometimes he can nap for about 2 hours. As of yet he hasn't mastered the art of rolling over but you can see he is trying so hard to. Hopefully in next month's post he may have rolled over even if it's just the once. Each month is becoming so exciting and i can't wait for all the other milestones you reach Joey.